The Guardian is a multi-agent environmental monitor with options for noise, particulate (dust) and ground vibration monitoring. The monitor automatically uploads all measurements via the cell network to the cloud. Reports are accessed using a web browser and alerts can be sent by email or text message. The Guardian can be fitted with any combination of the three main sensor types: noise, dust or vibration. It can also be fitted with wind speed and direction sensors, which are of particular interest when measuring dust or noise. You choose which sensors you need and the unit is delivered fully assembled - it just needs power. See the Sensors tab above for more information. The measurements are uploaded to the web servers over a standard mobile connection. An eSIM, which is an electronic version of the old SIM chip, is fitted so you don't even have to sort out a phone contract. The Guardian will connect to the strongest signal from a selection of networks. The monitors automatically send the measurements to a cloud server, where they are kept for long-term storage and reporting. Users simply log in to a web site to view the results, produce reports and set up alerts. Reports can be exported or emailed for local or other off-cloud storage. An outdoor Class 1 Microphone is fitted along with a calibrated Class 1 sound level meter. These meet the standards required by most environmental noise regulations and guidelines. The sound level meter module provides the environmental noise parameters such as periodic LAeq, LAFmax, L10, L90, over a measurement range of 20 to 140 dB(A). 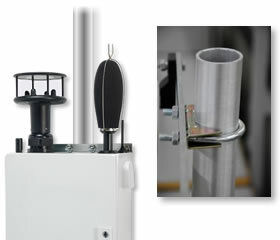 The microphone can be mounted on the Guardian box (shown in image) or there is an optional extension kit to mount to a mast or tripod. The particulate or dust monitoring option takes simultaneous, real-time measurements of PM10, PM2.5 and PM1.0 to a sensitivity of 1µg/m3. The inlet is heated to reduce moisture, with a particulate outlet at the bottom of the enclosure. A triaxial geophone measures the ground vibration within the range 2 Hz to 250 Hz. The ground vibration sensor comes with a 25m extension cable so it can be mounted securely to a suitable surface. We can supply the Guardian with any mixture of the these sensors. For example, if you just need to measure the sound level then just have the Noise option. 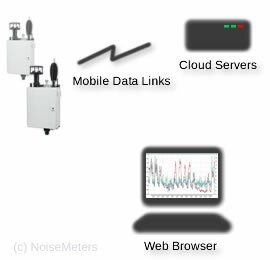 For a construction site boundary, you may be interested in just noise and dust monitoring. The sensors that you select will be fitted in the factory, so there is very little self-assembly to carry out during installation. Once you have selected the main sensors that you need (noise, dust, vibration), you can also add the wind speed and direction sensor. This is particularly useful for dust monitoring and for noise monitoring, where higher wind speeds can increase the background noise considerably. The Guardian Environmental Monitor is delivered with the selected sensors already configured and, where possible, fitted to the enclosure. It does not need a specialist installation team and in many environments can be installed by a single person. For a standard installation it just needs mounting on a wall or pole and power applied. The microphone, dust particulate inlet and wind sensor are mounted on the top of the box, while the vibration sensor comes with a 25m extension cable to allow secure mounting to a suitable, solid surface. The Guardian can be powered by 110 VAC or 240 VAC. It is supplied with a 110V cable as standard (coloured blue) as this is common for many sites. It can be optionally provided with a 240V (coloured yellow) cable with a standard 3-pin plug. To connect up, the power cable is run through a gland to the outside world and the plug fitted. The monitor is delivered with the data connection configured and active, so there is nothing extra needed here. For more information visit the Connection page. Three wires extend from the main enclosure, two for the mobile data antennas and one for the GPS antenna. The antennas have magnetic bases and can be mounted to the main box or higher for better connection. 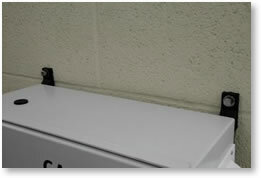 The monitor's enclosure can be mounted to a wall using the brackets at each corner. For clarity the image shows the box without any sensors fitted. The Guardian can be mounted on a standard 50 mm scaffold style pole. Cross braces fit across the back of the enclosure and U-bolts fit around the pole. The microphone can be mounted separately on the pole, using the optional extension kit, for better acoustic performance. The Guardian Environmental Monitor sends all its measurements to secure Cloud servers, so the reports can be generated and presented via a web browser. Reports can also be automatically emailed to specified recipients. The system administrator can create multiple users with different levels of access to the system. 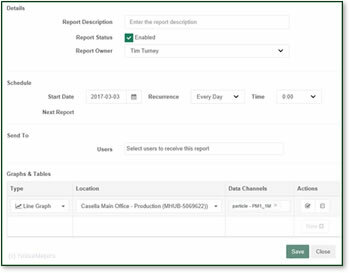 Users can be configured to just receive reports, or they can be given access to create reports of their own, from the data and monitors that they have been given access to. The first stage is to create a new report, selecting how often it runs (daily, weekly, monthly), and which users are to receive it. You then select the type of report (chart, table, etc), which monitor and which data channels (noise, dust, vibration) to include. The report will now run automatically when the data is available. 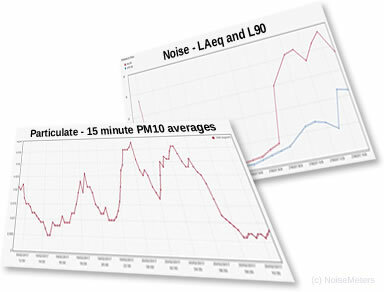 Report Configuration - A chart of PM10 readings every minute, report generated every day. You can view reports in a web browser, or they can be sent automatically by email as they come available. Based on a measured parameter (noise, dust, vibration) exceeding a preset level. Errors - power loss or communication failure. Alerts can be sent to multiple recipients by email or text. When purchasing the Guardian Environmental Monitor you need to specify which of the three sensors you need: noise, dust, vibration or any combination of the three. Please note that the main sensors (noise, dust, vibration) along with the Wind Sensors and Mic Extension are all factory fit options. They cannot be ordered later and be easily fitted on-site. To add these options after delivery you can return the unit to have them fitted and configured. The CELGO-240V Power Cable and CEL120/1 Calibrator can be supplied and shipped at any time. The exact specifications for the Guardian Environmental Monitor depend on the options that are fitted. These options, or sensors, include noise (sound level), dust (particulate, PM10, PM2.5, PM1.0) and ground vibration.